Dental implants are not the latest trend, as a matter of fact their use can be traced back to as early as 2000 BC, where primary versions of dental implants using carved bamboo pegs were used in ancient China. Throughout time, they have grown so much in popularity, becoming a significant part of mainstream dentistry that is here to stay. The latest Canadian Dental Association report on the state of oral health shows that just under 2.5 million people reportedly had dental implants throughout 2017. Based on this and other important factors, it’s safe to say Canada is among the world leaders when it comes to the overall oral health of its citizens. In addition to this and probably another beneficial aspect, waiting times for dentists and treatment in the country are also reported to be the shortest in the world. With countries where it can be days or even months before receiving care, not having to deal with such an issue can make a world of difference for patients. In a wider context, globally the most frequently diagnosed oral diseases are dental caries, gum-related diseases, oral cancer, oral infectious diseases or trauma injuries. While the numbers of people affected particularly by tooth decay are staggering: 60-90% of school-aged children and nearly 100% of adults. These percentages alone should raise concerns and highlight the need for improved awareness and improved access to dental services. On the bright side, Canada is considered to be one of the countries with the best access to oral health care in the world. Collectively, Canadians have seen major declines in levels of dental decay over the past 40 years. And the positive trends continue: the number of people who see their dentist at least once year increased from almost half of the population (49.5%) to over 74%, the numbers of children and teenagers with at least one tooth decay were also slashed in half while the number of adults who reported having natural teeth grew by over four times. These incredible findings are a result of a joint effort made by clinicians and people altogether. Perhaps just as important as having regular check-ups and addressing problems as soon as they arise is good oral hygiene practice at home on a daily basis. Most Canadians (73%) brush at least two times every day and over a quarter report flossing five times per week. But even with the best of maintenance, things can happen and it’s essential to know how to keep a bright, happy and healthy smile. Studies show that there are a couple of trends and factors currently driving the tooth replacement industry in North America. The first one which is a wave we are witnessing at a global level has to do with demographics and more specifically, the rise of growing aging populations which will require more and more tooth replacements. 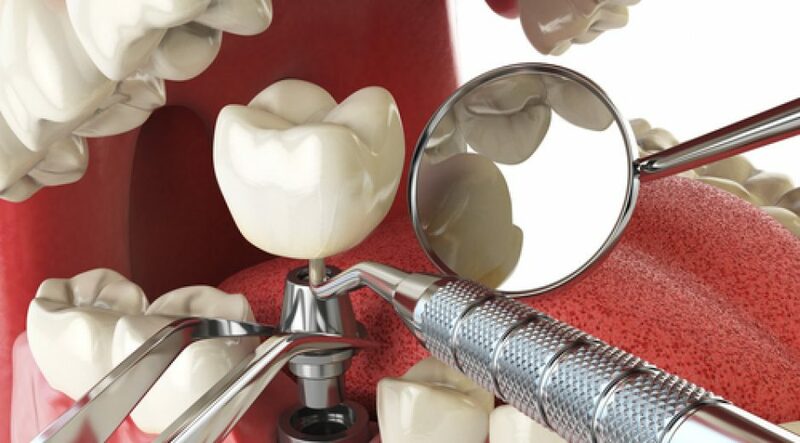 At the same time, the number of highly skilled dentists who are performing dental implants. This is nothing but great news as patients are now more aware and better informed about the dangers of poor oral health and certainly, aesthetics are an important driver as well. All these factors are inter-linked and feeding into each other. Dental implants are now the go-to solution when someone faces a missing or fallen tooth as opposed to dentures or bridges which may sound like a good idea to begin with but turn out to be a bad one along the way. However, they can be quite uncomfortable and many times even cause further deterioration. Experts define dental implants as titanium or zirconium screws which are inserted into the jawbone and capped with a permanent crown. Because of the technique behind the procedures they ensure best results for the longest periods of time (many not even having to deal with any issues for the rest of their lives!) and they are also the most aesthetically pleasing option as they ‘blend’ in perfectly with natural teeth, especially if professionally done. In a Swiss study that lasted for six years and involved 4716 patients between 45 and 74 years old, results showed high levels of satisfaction. About 94% said they were extremely pleased with the overall results and how the implant looked, while 83% admitted they would consider the treatment again and that it was worth the cost. To complement these findings, another study published in the Journal of International Dentistry suggest dental implants resulted in improved quality of life n among postmenopausal women with osteoporosis. They also showed the highest satisfaction in emotional and sexual areas, as opposed to those who did not have the procedure and scored lowest in those areas. As the trend moves to a more patient-centric approach than simply delivering dental treatments, understanding how people feel about the services they receive and how that affects their lives is key. Research in dental implants has clearly pointed out that aesthetics are just as important as their functionality. This also reveals an important aspect for patients seeking treatment: dentistry treatment clinics should be thoroughly investigated exactly because the stakes are so high. For example, hearing from someone at the leadership of a clinic can give a great insight into what to expect. When looking for the most appropriate services, a practice that offers integrated treatment which can be anything from cosmetic dentistry to general dental procedures should always be the way to go. While Canada is among the world leaders when it comes to oral health and about 84% of Canadians state that their oral health as being good or excellent, there is still more work to be done.